Buffalo Bills Beef Jerky is a brand that focuses on using 100% all American-made ingredients, including USA-born and bred cattle. It's produced by Lebanon, PA-based Choo Choo R Snacks, Inc.
Having been in the business since 1990, the company makes a wide range of meat snacks, and several lines of beef jerky. This "Western Cut" line represents the thin cut and dry jerky, while their Country Cut represents the soft and tender line. They also have a premium line. 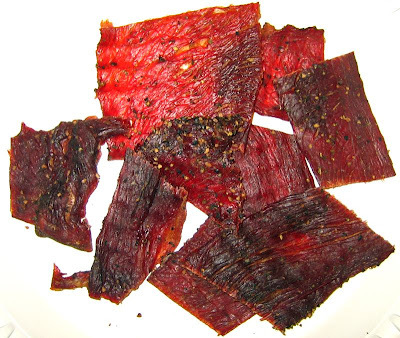 Black peppered beef jerky is one of my favorite varieties, and a favorite for many people as well. It has a taste that compliments beef better than any other seasoning, adding a great contrast to beef's mild flavor. Sweet is the first taste I detect upon placing a piece into my mouth. Then I taste the smokiness. Upon chewing a bit, the natural meat flavors make themselves known, and lastly both the teriyaki sauce and the black pepper start showing through. Note that I started with a piece that had a moderate amount of black pepper. As you can see in the photos below, some pieces are heavily peppered, others moderately, and some very little pepper. I tried that heavily peppered piece you see in the middle, and the taste of black pepper hits me right away. That sweetness comes in soon after, but on this piece the abundance of pepper overwhelms every other taste. So as a black pepper variety, what you're getting are pieces in varying degrees of pepperness. I don't necessarily see this as an issue, though I can understand others might taking exception. If you really love black peppered jerky like I do, you'll actually appreciate the variety. The sweetness I described is not an overwhelming sweetness. The teriyaki sauce listed in the ingredients does taste like teriyaki sauce, as opposed to soy sauce. But it too is not overpowering. The natural meat flavors in this are easily distinguished and provide plenty of satisfaction for meat snackers. The smoky flavor also comes out well. Overall, this is a very tasty variety of black peppered jerky from Buffalo Bills. Not only does it offer a great meat taste, but it offers a flavor contrast between the black pepper and sweet teriyaki. The moderate to heavy peppered pieces have black pepper as a dominant flavor, while the lesser peppered pieces are more like a light teriyaki variety with a black pepper background. These appear to be slices of real meat, sliced thin, and in small to medium sized pieces. 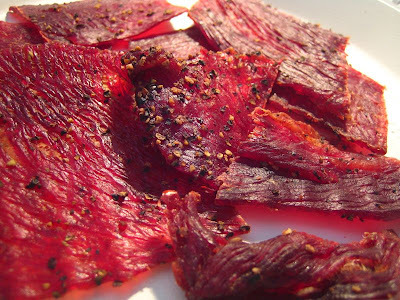 Being a dry, thin cut jerky, these pieces still retain a lot of flexibility. For the most part, I find them easy to tear apart and chew. I found one twisted and gnarled piece that was very tough. After softening that piece in my mouth, it was piece of gristle, tendon and meat all fused together. As for gristle, I found another piece with a good-sized streak of it. Fat-wise, some pieces had some small streaks, and others have some good marbilization. Overall, the meat consistency is good. The one meat piece with gristle, and the other meat-tendon-gristle chunk is something to make note of. However, the rest of the pieces offered a good beef jerky experience. I've found that Buffalo Bills' Western Cut line tends to have a fair amount of gristle, though some packages might not have any, and others might have plenty. It's a hit or miss issue. However, since I've been reviewing the brand's 1.75oz packages, it's likely these smaller sizes have less gristle per package. The larger 3.5oz bag could have more gristle simply because there are more pieces. Choo Choo R Snacks, Inc. sells this jerky from their website at a price of $3.29 for a 1.75oz bag. That works out to $1.88 per oz, putting this into the average price range. You can get this for $1.57 per oz if you buy their larger 3.5oz bag. I think this variety will give you a great value, in that offers a great taste, and mostly easy-to-eat pieces. It stands up pretty well as a black peppered variety, giving you pretty much what you're bargaining for. This black peppered Western Cut variety from Buffalo Bills offers plenty of spicy black pepper taste contrasted by a sweet, yet light, teriyaki basting. The natural meat flavors are well preserved in this and are complimented by a good meat consistency. And while I said it has a good meat consistency, it appears to be a hit or miss issue. One bag of this stuff may be totally free of gristle and tendon, while another bag might have a lot of it. This "best" rating is based on this particular package. Others with more gristle will get lower ratings. Overall, it has a great snackability. I found it difficult to resist eating more and more.